This is a really adorable model of a baby Elephant, it is ideal to use in any jungle or safari themed area. This figure is so cute, children and adults alike love him. 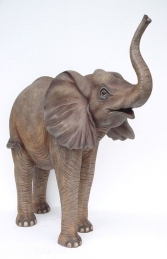 Our Baby Elephant resin statue is one of our most popular pieces. He looks fantastic in any situation, adding to a safari or jungle themed area & works really well with the adorable Sitting and Standing 5ft Baby Elephants (JR 2232 & 2233) and our Life-size Jumbo Elephant. 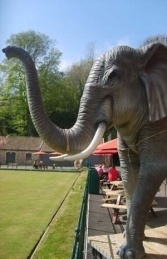 This Baby Elephant model can be used in any Jungle or Safari themed areas in adventure golf courses, zoos, theme-parks or to promote shops, businesses, pubs, restaurants, coffee shops. It would even look fabulous in your own home or garden.